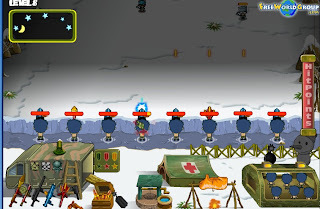 Pet Soldiers is a point and click tower defense game from FWG about managing troops of soldiers to defend their base from waves of enemy attacks. The game features nice cartoon graphics and sound effects. Help your little army deflect the enemies by fetching them what they need in battle such as water, medicine, ammo and of course weapons. After each round you will earn honors which you can use to purchase upgrades before proceeding to the next level. Also, there are bosses that will make it more challenging as you play further. Interesting game though you may find some bugs (it would be fixed for sure). Meanwhile, here is a short gameplay video including a couple of boss battle while we wait for a complete Pet Soldiers walkthrough to be available.